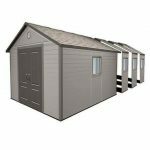 An all weather storage facility can make a big difference to your property, which is why this pent roofed shed can be an ideal and inexpensive purchase. It’s based upon a lean to design which means that it can be sited against a wall to give extra weather protection, but the pitch of the roof itself is highly effective at carrying rain or snow away. We can easily imagine this being used to store a bicycle, fishing or golfing equipment, or simply for garden tools. The PVC cladding offers many advantages over other substrates such as timber or wood, one of them being that it’s fire retardant meaning that you can safely store flammable liquids inside. It’s also free from concerns about rust, rot and fading, so once it’s been installed you can get the full use out of it without ever having to treat it again. For a plastic shed it’s surprisingly strong and sturdy, and that’s not only testimony to the effectiveness of the PVC cladding itself but also to the thick steel frame that supports it. Thanks to this natural strength and in built weather protection the manufacturers have been able to supply a 10 year warranty. 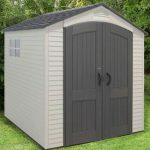 This mid sized plastic storage shed looks very different to most that we review, and that’s because it adopts a lean to form. This means that it has a flat back and a pent roof, making it easy to stand next to the wall of a building. This is something that we feel gives added value, as it not only means that the shed takes up less space in the garden itself, it also means that it’s given extra protection against rain, snow and wind by the wall that is adjacent to it. 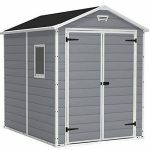 With the width of this shed, by which we mean the side with the door, measuring 1.21m and the depth nearly doubling that at 2.40m there’s quite a lot of storage space available, although it has to be said that this is one of the shorter plastic sheds that we’ve reviewed. Even though the pent roof does give a little extra height, the peak height is 1.83m and the eaves height only 1.60m. As anyone who has PVC windows, fascias or soffits knows, it can be a very attractive material, and the overlapping design used on the roof and wall cladding is pleasing to the eye. We also found it reassuringly solid once assembled, and that’s due to the influence of the steel frame and supports. There is no floor included as it’s designed to be erected directly onto a flat area of concrete, or alternatively onto a level patio or paving area. This area will need to have dimensions of at least 2.40 X 1.21m, so keep this in mind when thinking about where to position it. 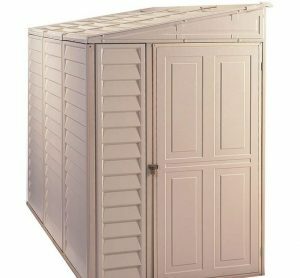 We were pleased to find that Duramax have supplied a 10 year warranty with this shed, but in all likelihood it won’t need to be used because the PVC substrate is so long lasting and isn’t prone to damage from rot or rust. Another advantage that comes from owning a plastic shed is that there are no treatment requirements, and the only maintenance that will be required is an occasional wash or hosing down. That makes this an ideal choice for people with mobility issues, or who don’t have the time to spend carrying out annual treatments. One feature that we feel could have been a little better is the door. It’s a single hinged door, and its positioning in relation to a likely supporting wall means that it could potentially be difficult to move wider or irregularly shaped objects inside. With an opening width of 0.76m and an opening height of 1.57m, which is the equivalent of 5’2”, the owner will probably also have to remember to keep their head down when walking in and out. There is no window included as standard, but there is an option to add a window kit which we were glad to see as it allows for more customisation on the part of the customer. The lack of windows helps to keep prying eyes away from the contents within, and by careful positioning next to an obscuring wall the shed itself may be hidden away from passers by. If valuable items are to be stored inside, however, further precautions should be taken and while we were pleased to see that the door is ready to accept a padlock it was disappointing to see that the padlock itself will need to be sourced and purchased separately. 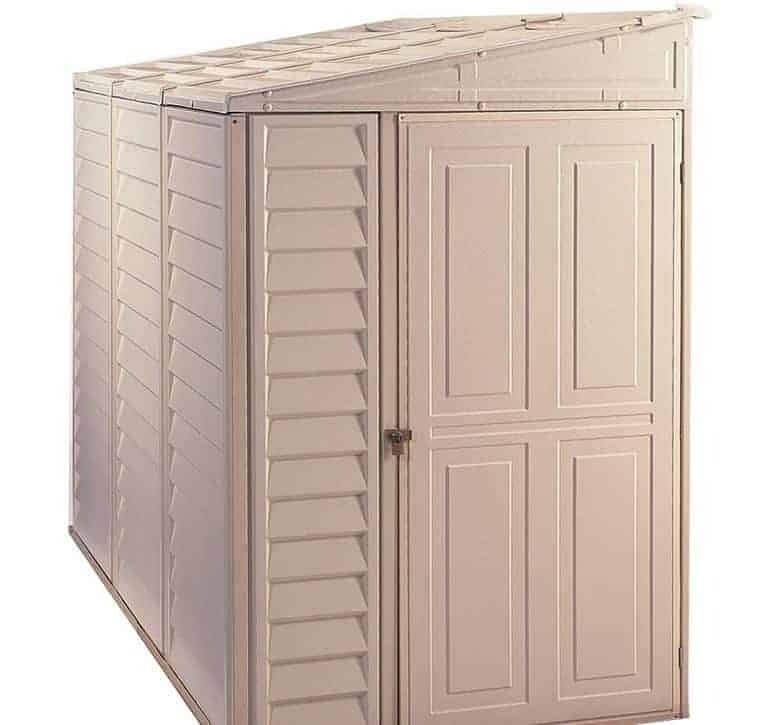 If you already have a suitably level area of concrete then this shed comes with all the fixtures and fittings needed for a quick installation. We were pleased to see, however, that a steel foundation kit is available as an optional extra for those who don’t currently have a flat area large enough to use as a base. The kit makes it easy to create a suitable and perfectly sized area of concrete, even for those with little or no experience of construction, although at £70 it does also add significantly to the initial purchase price. The use of a tough steel frame to support the PVC cladding is just one example of the high quality components we found throughout this shed. By its nature plastic is a very durable material, so we wouldn’t be surprise for this to last much longer than the 10 year warranty period suggests. 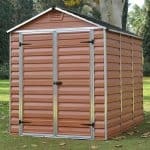 Whilst this shed has an accommodating depth, the width and height both restrict the overall storage space available. The use of a shelving unit, available as an optional extra, can help the owner make the most of the vertical space that is available. There are quite a lot of components here, so we’d recommend allowing six hours to complete the assembly, with a friend’s help, rather than the two to four hours quoted by the manufacturer. 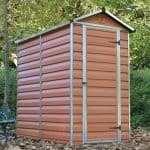 We like the design of this shed and it’s durability, but there are larger sheds available for a similar or lower price. Final Thoughts: More and more people are keeping fit through cycling, but that means they need somewhere safe to keep their bicycle whatever the weather. With the addition of a padlock we feel that this would make a perfect bicycle shelter, and it’s compact design mean that although it’s wide enough to receive a standard bicycle it won’t take up too much room on your property. 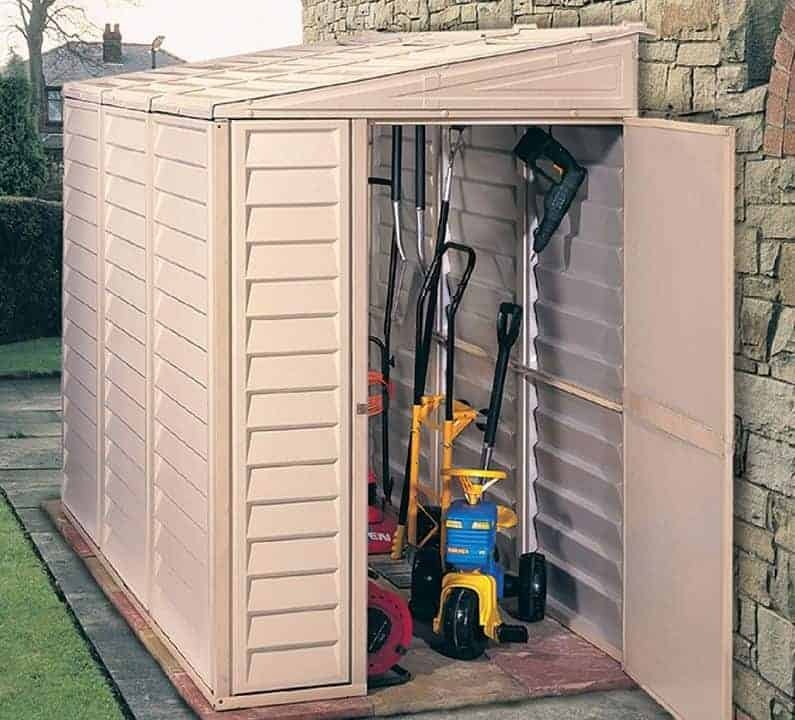 That’s just one possible use, of course, but whatever you keep inside you’ll be pleased to know that the shed itself is durable and very weather resistant particularly if it’s given further protection by a supporting wall.